When planning food for a party menu, I usually try too hard. Often, I want guests to be impressed: I think of dishes that will look amazing, use exotic ingredients, and be overly unique. And yeah, I’ll admit that it makes me a stressed out wreck for the beginning part of the holiday season. Over the years, the most important thing about entertaining I’ve learned is that guests appreciate and enjoy the small things. Over the top can be fun, but a new take on a classic comfort food often gives friends a sense of home. Instead of giving myself so much work and an extremely long grocery list (and bill! ), this year I aimed for foods that are simple and homey: dishes that remind friends and family of their favorite foods. And what’s more comforting than a baked potato, especially when it’s a salt roasted potato!? Growing up, Sundays were reserved for a large noon meal. Mom’s classic menu was meatloaf, green beans, and baked potatoes. I never really appreciated the baked potato part, though. I complained that they were boring and only wanted mashed. Mom would always entice me by removing the skin from the flesh and spreading the top with a generous helping of butter. With this type of preparation, I couldn’t help but get hooked on baked potatoes. Potatoes should be easy: you wash them and throw them in the oven. Simple, right? But oftentimes, things can go wrong. If baked too long, at too high of a temperature, or if using the wrong potato, the result can end up being dry and bland. But when perfectly baked, a potato can be creamy, moist and hearty. 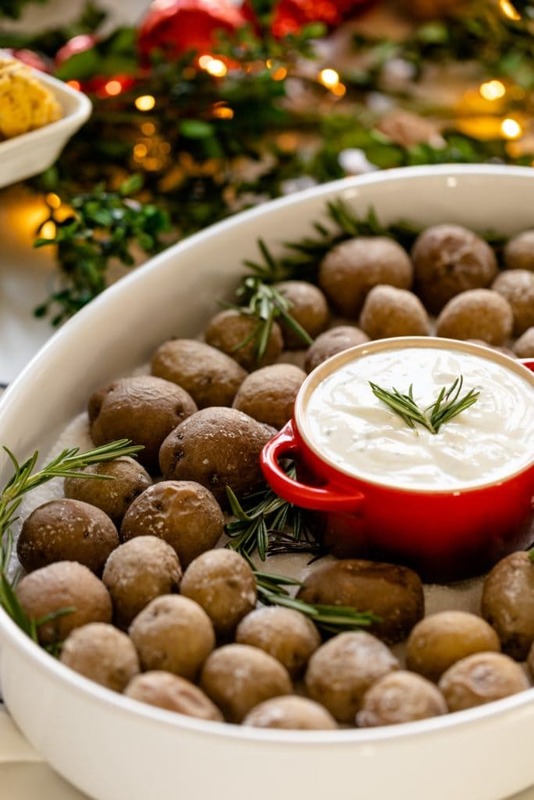 To give this comfort classic a Christmas party makeover, I chose small potatoes that are two bites at most. For even baking and AMAZING moisture retention, I roasted them in kosher salt. The amount of salt seems scary but does not actually enter the potato. Instead, the salt insulates the potatoes and leaves them at the best texture. 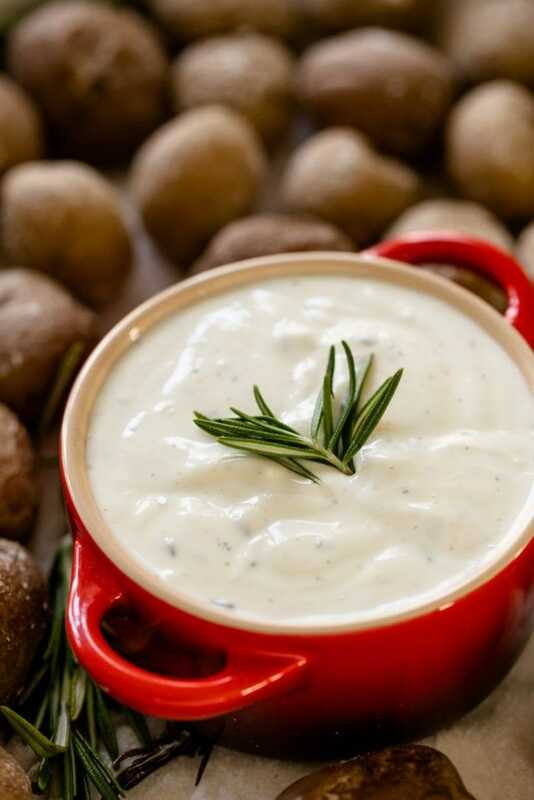 For the pièce de résistance, I make a quick sauce that turns out to be a rosemary ranch sauce. It’s tangy. It’s herby. And when paired, each bite of potato will make you crave another. Mmmm… that rosemary ranch dipping sauce is just too good! 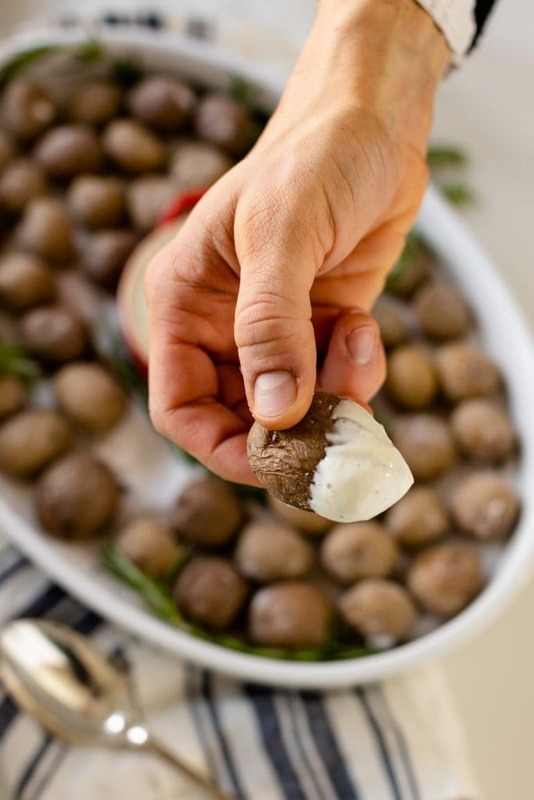 Roasting potatoes in salt is the perfect way to retain the moisture of the potato. 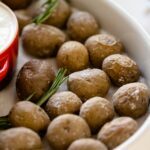 That’s why these bite-sized potatoes are such a delicious appetizer to whip up! Evenly sprinkle 1 cup of the kosher salt in a 2-quart baking dish. 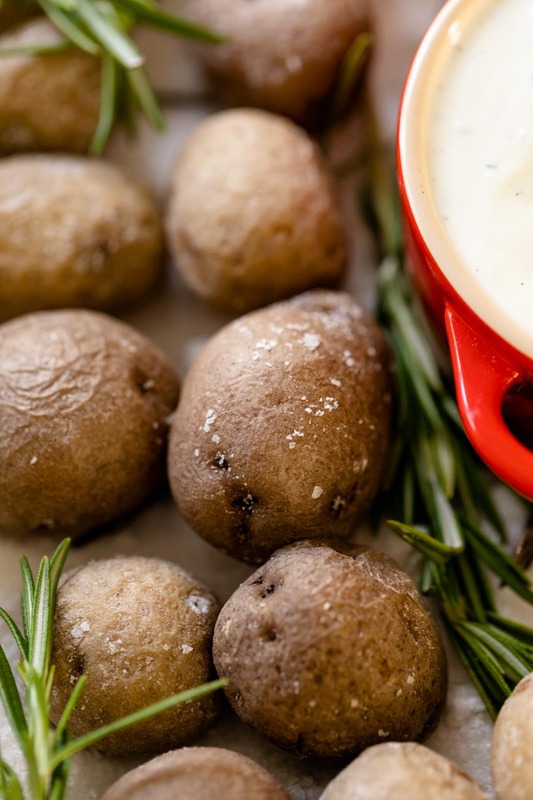 Evenly nestle the potatoes in the salt and place the rosemary sprigs on top. Cover the potatoes with the remaining salt until they are completely covered. Bake in preheated oven until the potatoes are tender and a knife inserted meets no resistance, 35-45 minutes. While cooling, prepare the sauce. In a bowl, combine the Greek yogurt, buttermilk, mustard, rosemary, salt and pepper. Whisk to combine and add more buttermilk if needed to thin the sauce. The sauce can be made the day before and chilled in an airtight container. After the potatoes have cooled slightly, lift the potatoes from the salt. Wipe any excess salt from the potatoes. 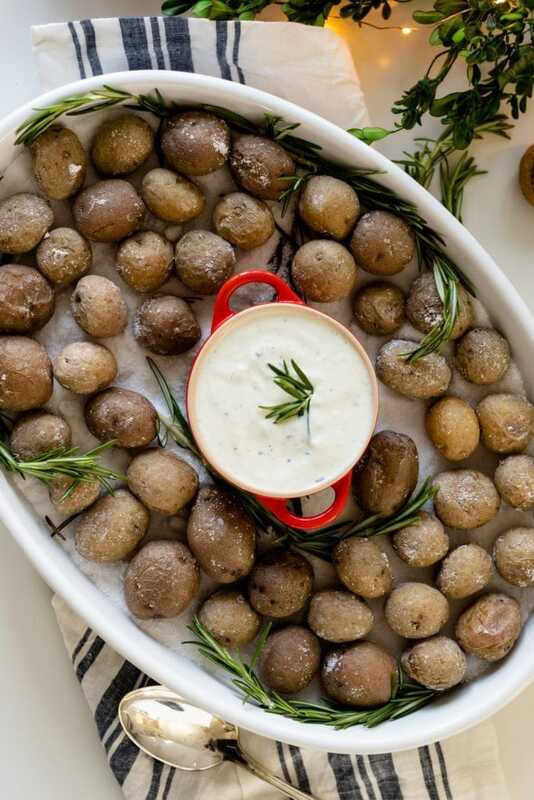 Serve the potatoes on top of salt in baking dish alongside the prepared sauce.